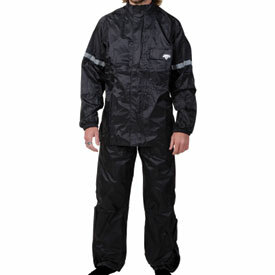 Two-piece 100% waterproof rain suit. 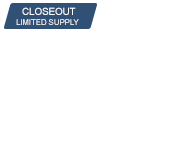 Jacket has full-length zipper with Velcro® storm flap. Reflective striping for night visibility. Pants feature ankle gussets for easy boot entry. 2 year "No Hassle" warranty. I've only had to wear it once, but it did the job as expected. Seems to be a pretty nice suit for the price. Haven't needed it yet but it fits in my moose racing number plate bag well. I'm sure it will come in handy some day. BEST ANSWER: It does not have a hood. It does have a nice tall collar with wicking material. With a full helmet I did not see the need for a hood while riding. The gear works great when riding in the rain. I recommend this suit. No it does not but it does have a pretty good deal around the neck if you zip it up all the way. I wasn’t worried about a good because my helmet served at keeping the rain off of me. The orange and black rain suit I bought did not. SIZE RANGE FOR CLOTHING NUMBER SIZE TO MATCH S M OR L OR XL OR XXL ? BEST ANSWER: In women.... X-small= size 0 -2, small= 4-6, Med = 8-10, Lg = 12 -14, 1X =16 -18, 2x =20 - 22 , 3x = 24 -26.